Whenever a client stops by and sits down at our office, we never know what to expect. Last week we were visited by a client whose inheritance was given by Queen Mary to her Aunt. Queen Mary had gifted her a beautiful diamond brooch from the 1800s as well as a very rare opal band. It’s incredible to see the rarities people bring in and that we get to purchase. Here are a few images from that lot and a few other goodies we recently had in our office. The brooch and ring we value currently at approximately $20,000 each. 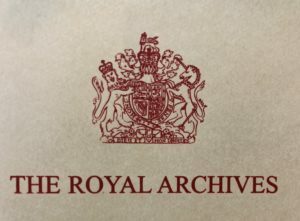 The brooch comes with a proof of provenance showing that it was a gift given by Queen Mary and the ring is also in the middle of getting similar paperwork from the Royal Archives. 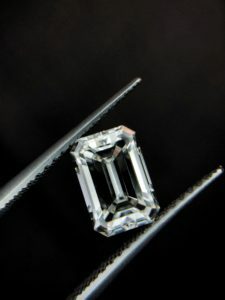 This is a gorgeous emerald cut with a ratio of 1.45, which is what makes it amazing. The long looking emerald cuts are difficult to find, and often command premiums since when mounted will elongate the look of a clients finger. This beautiful stone is an I color and Vs clarity. 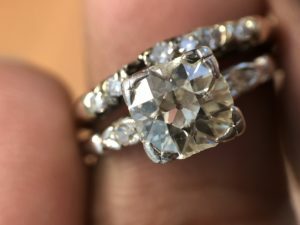 The last item we wanted to mention, which was recently purchased is a chipped up diamond. 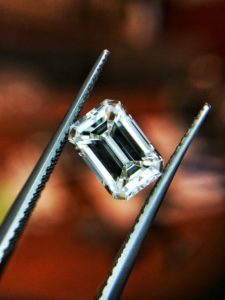 Most clients are surprised to hear that diamonds can chip easily, especially since they are the toughest gem. The toughest gem is not tougher than other elements like metals or even wood. Dinging the diamond against a hard surface can create chips or break as seen below. The diamond below that we purchased is 1.44 carats and will need to be recut. The new stone weight will be somewhere around one carat when completed. Broken and chipped diamonds still have significant value since the majority can be repaired and recut. The moment a client visits our office, we are in anticipation of what they will pull out from the jewelry bag. 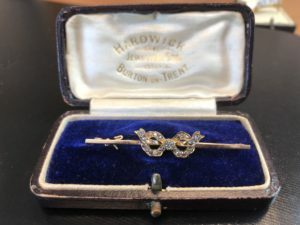 Rarities like the several listed above, or the gems and fine watches we have also acquired, keeps us on the edges of our seats excited to buy more. 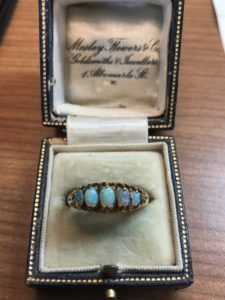 We invite you to make an appointment with our office and give us an opportunity on buying your jewelry, from an estate inheritance or items you just don’t use anymore. We love it all. Jewelry is our passion and we are proud of it, see you in our Atlanta office soon!